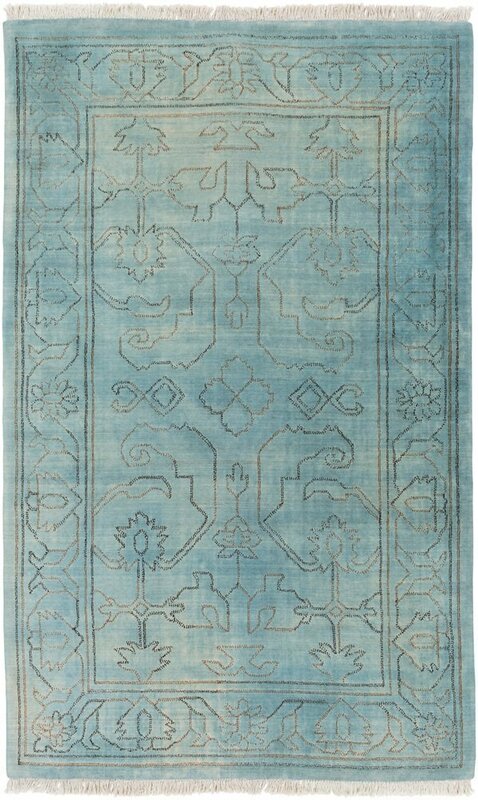 I spend a lot of time researching and specifying the best rugs online for my clients and for my own home. It’s not easy knowing what to look for when you’re shopping for a rug online but there are some easy tricks that you can use that will help you make a good decision when you can’t see the rug in person. 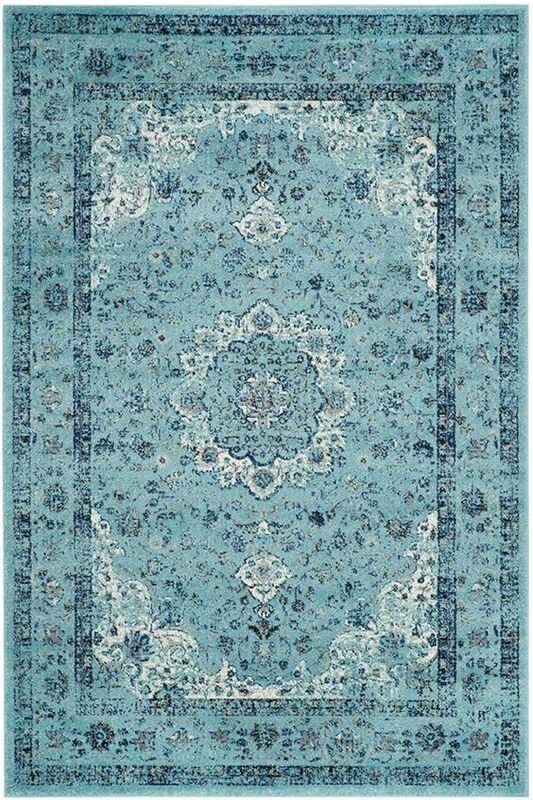 Today, I wanted to share with you some tips for finding the best rugs online, what to consider and what online stores to search. 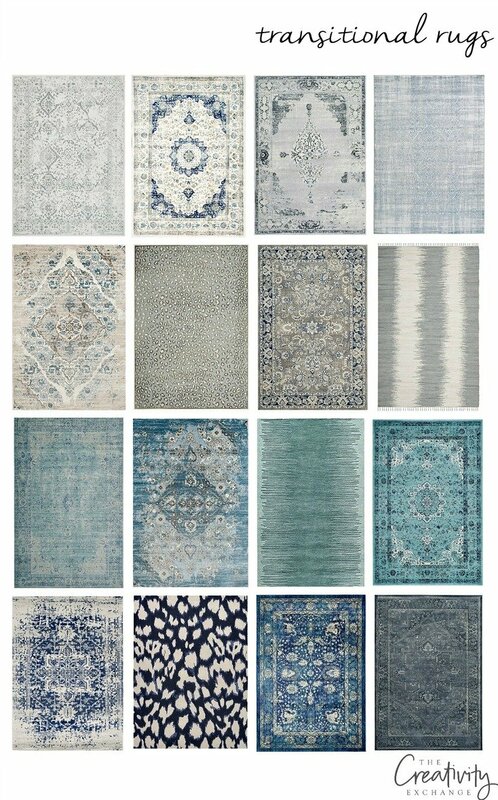 I’m also sharing links to some of my favorite rugs and at the end of the post, I’m also sharing my little trick for finding the best rock bottom prices online as well! You’ll also notice that today, I kept the rugs pretty safe and neutral/transitional. I’ll share some of my favorite bolder/colorful rugs in a separate post in the next couple of weeks. I have several online stores that I like to use but you might be surprised to know that the first place I always look is Amazon. The reason I do this is because Amazon carries all the great rug lines that are so easy to search including Surya, Safavieh and NuLoom. 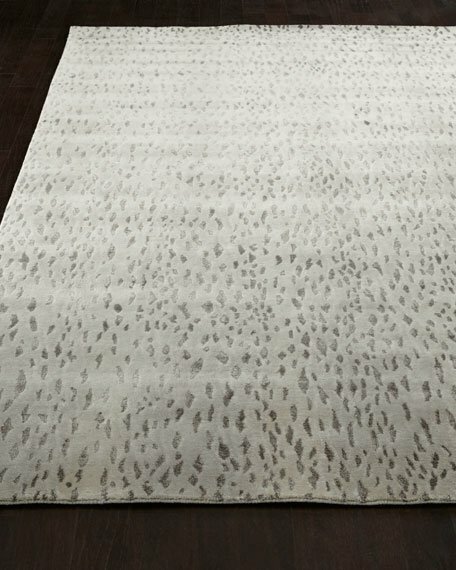 While there are several online rug specific stores, I have had poor experiences with several of them with not being clear if a rug is backordered/shipping delay. Amazon requires vendors to note in the description if the rug is on backorder or how long shipping takes. 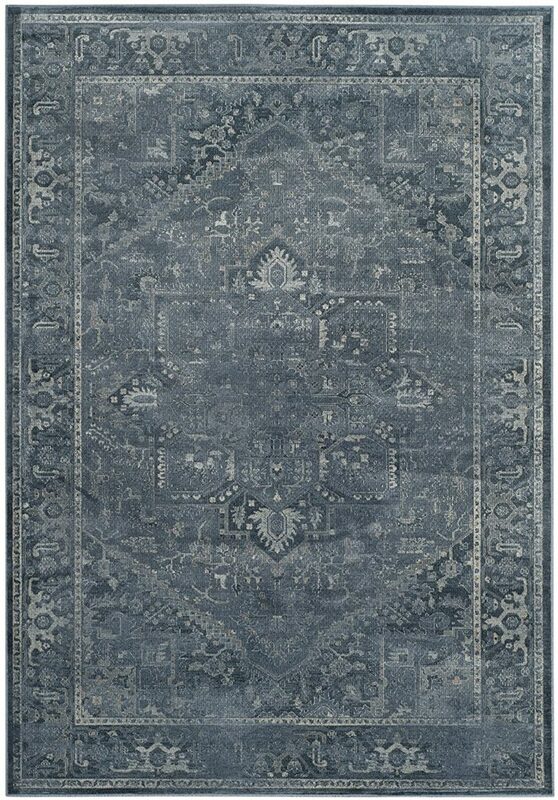 In the past, I would order from an online rug store that clearly says the rug is available to ship and then after I purchase it, I receive an email that it’s backordered for four months or will take eight weeks to ship. Amazon also has reviews that are very helpful in determining any issues. Often times reviewers will get more descriptive of the color and quality. 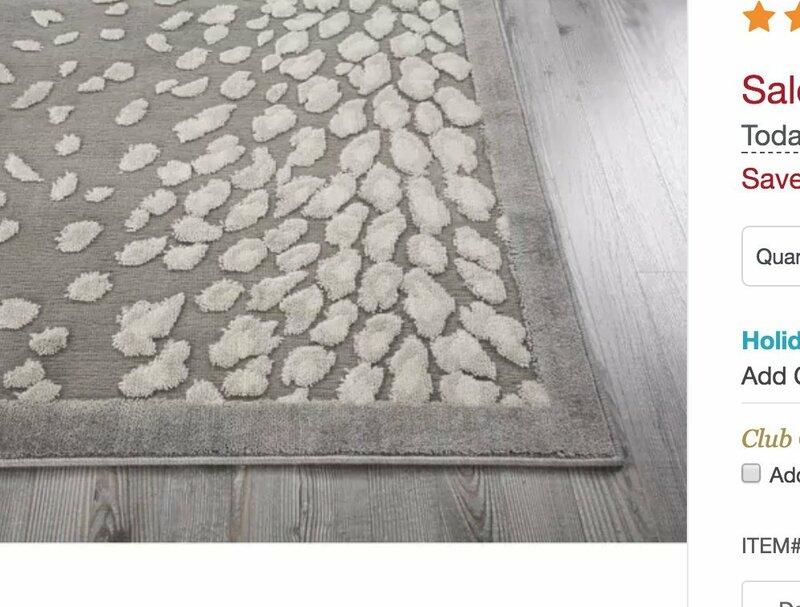 I never buy or recommend a rug to a client without reading the reviews first. 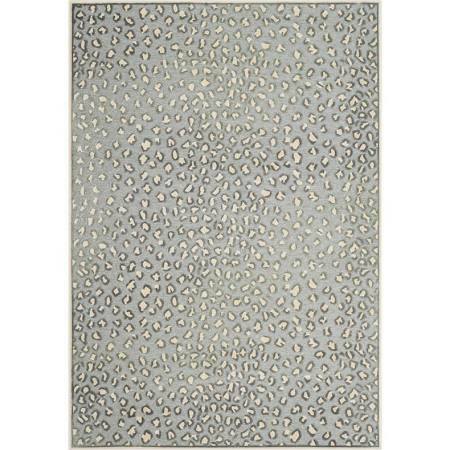 I have also been very surprised lately with Overstock and have been buying rugs there as well. 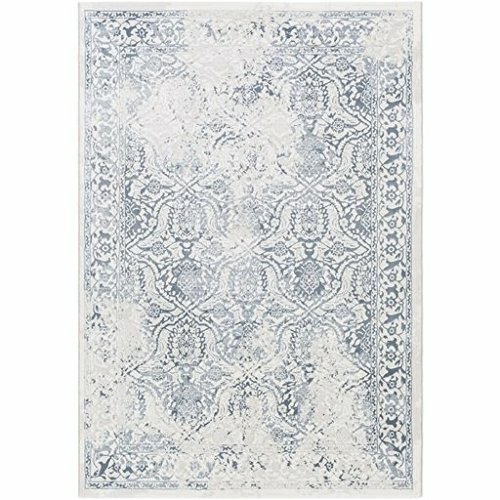 Again, they carry some of the great rug brands at fantastic prices and they are clear if rug is on backorder/shipping times. For higher end rugs for my clients and myself, I look at Lulu & George and Horchow/Neiman Marcus. While these stores are significantly more expensive, you can pretty much guarantee that their rugs are very well made. Click on each one of the images and angles to get a better feel for the rug. I always pull up the close-up corner shot of the rug and zoom in. Looking at the corner of the rug will give you the best feel for pile/thickness of rug and color. As I look closely at the corner of the rug above, I can see that while rug looks somewhat well made, I can also tell it’s not terribly thick. 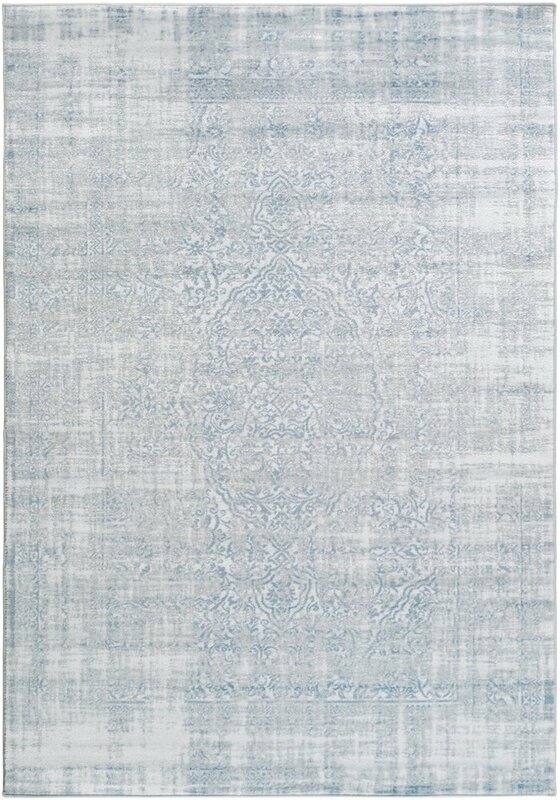 Of course, a well made rug will have a thicker pile and wider edge stitching. On a scale of 1-10 on rug quality, I would say the rug above is probably about a 5. However, it doesn’t mean I won’t buy it because there are some areas in a home that a low-end rug is just fine and look just as good as a high-end. 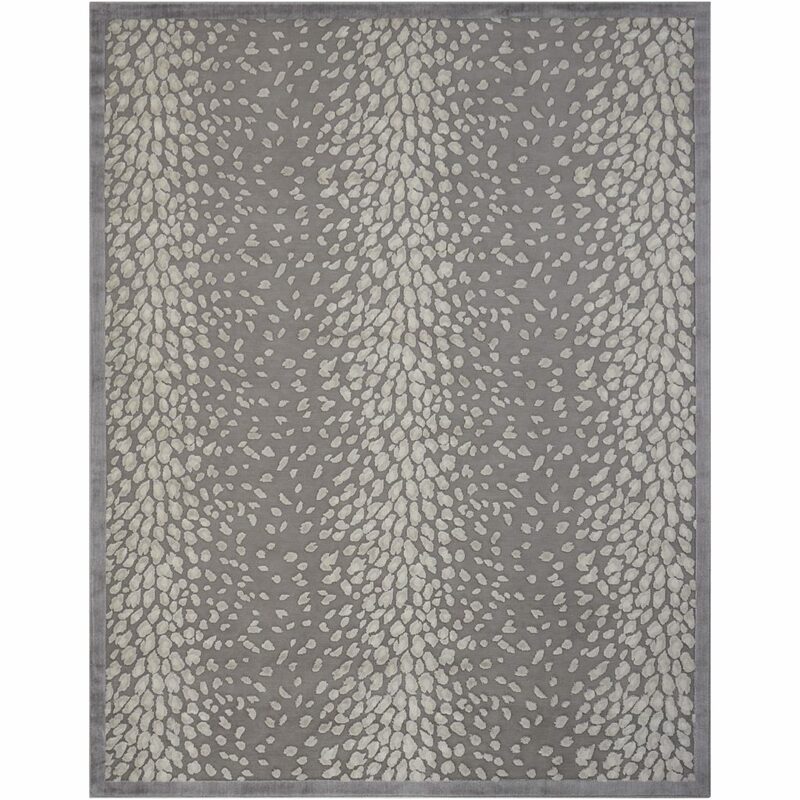 If I need a high traffic rug for a client, I would for sure not recommend this rug! Also, look closely at the image above and you can also get a better feel for undertones in the color as well. 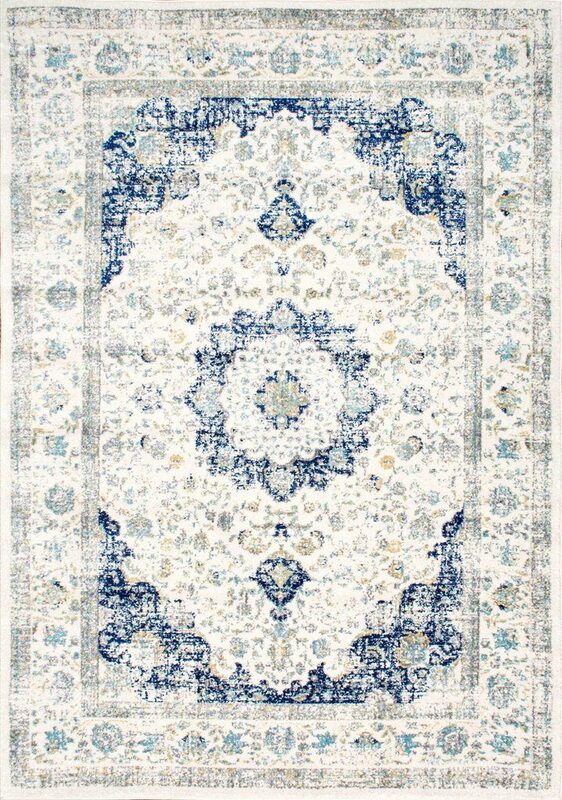 Look at the listed material for the rug as well and keep in mind that a rug made with viscose or a combination of wool and viscose will not be ideal for high traffic areas, bathrooms and kitchens (areas with water). 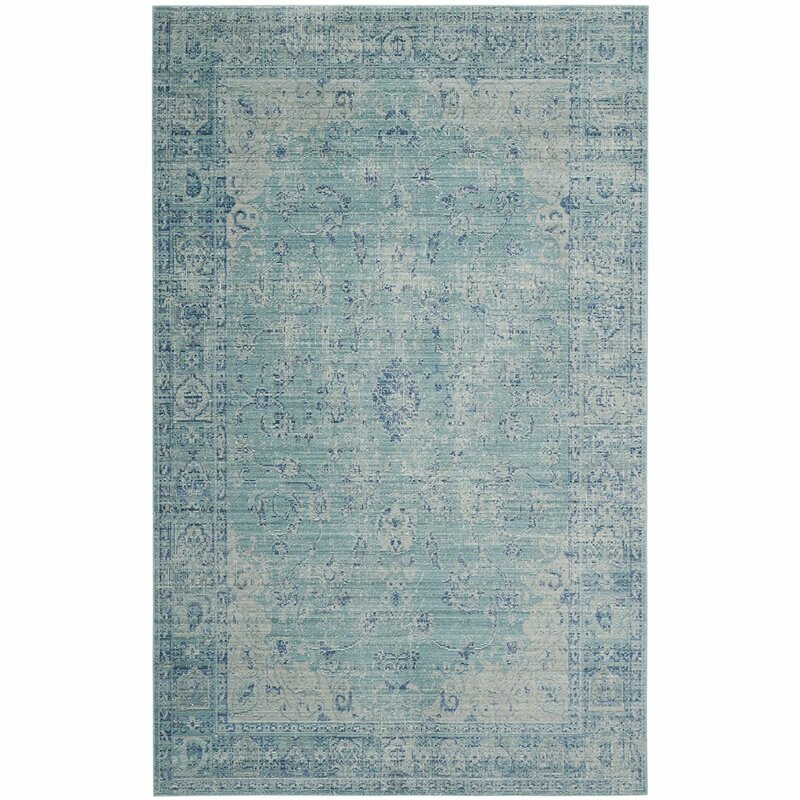 The rug above is 100% viscose, which means it is not very durable and needs to be in a low traffic area. 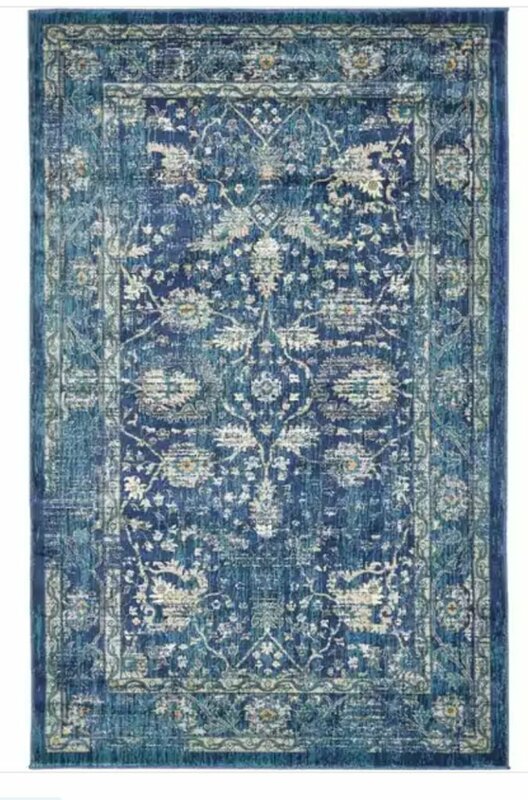 I also read the reviews not just on the site I’m considering buying from but I always search the name in Google to see if I can find other reviews of the rug on other sites. 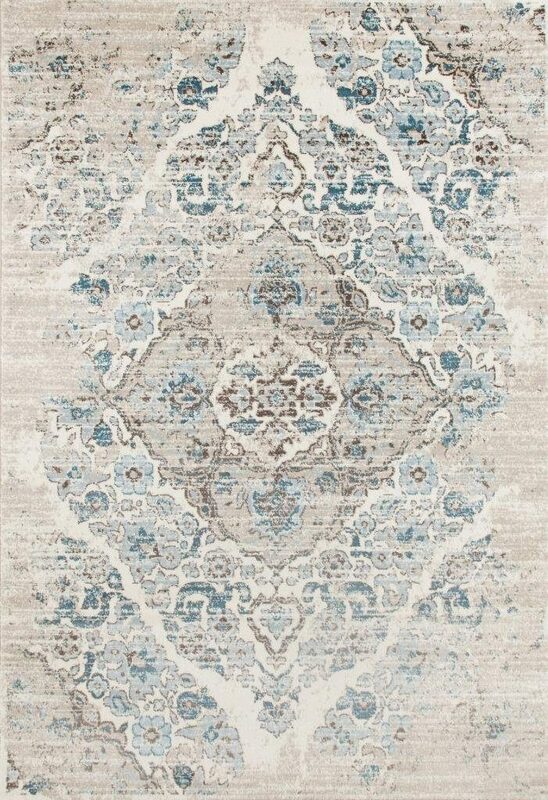 When it comes to rugs, reviewers are awesome and always detail the color, if it was true to the image and other things the may have noticed about the rug. 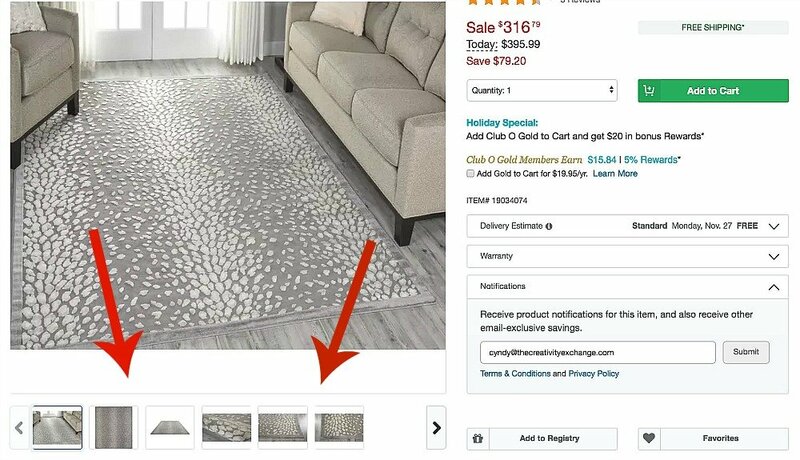 With so many online stores carrying the exact same rug, the great news is that there is an easy trick to quickly finding the best price! 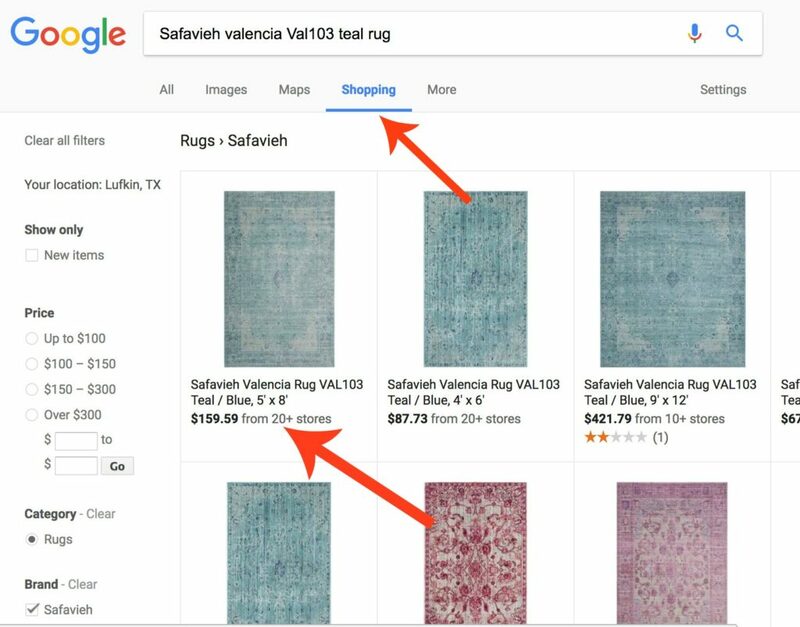 I type in the name and brand of the rug into Google search and when the results come up, I click on shopping below the search bar to see all the prices online. Here’s an example below. You can see my arrow for where to click for search to switch over to shopping and the arrow for where the multiple stores come up. You’ll see that when it comes to rugs, the price differences online can be VERY significant. I always look to see first where Amazon is in the comparison because as a Prime Member, I get free shipping. Shipping can also be significant on a rug. I sure hope this post helps you when it comes time to find a rug online that you will absolutely love! Armed with this information, you should be one step ahead! Any recommendations on a good natural fiber/jute rug? Excellent post! 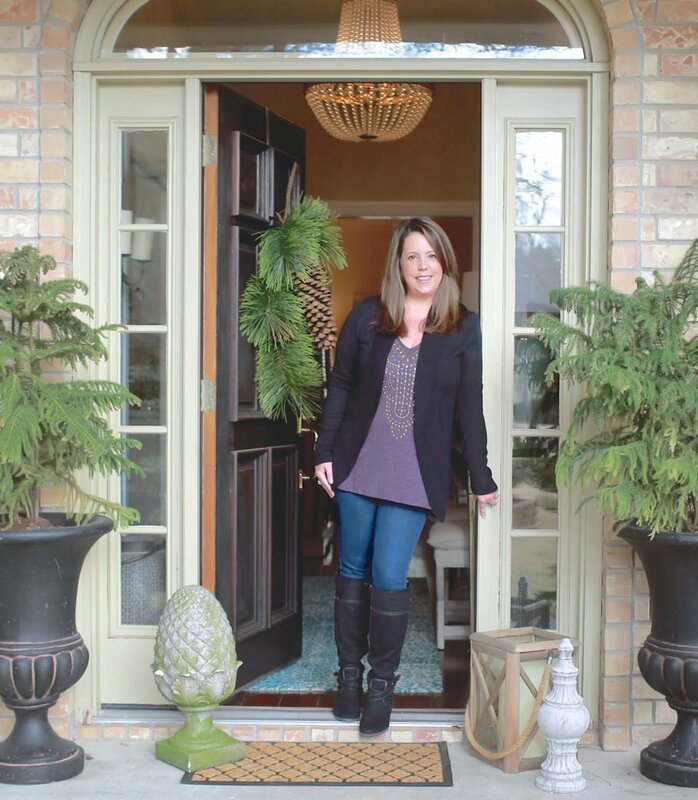 I personally shop most of our home furnishings online and gathered some good tips here. Thank you. Love the info you have provided. 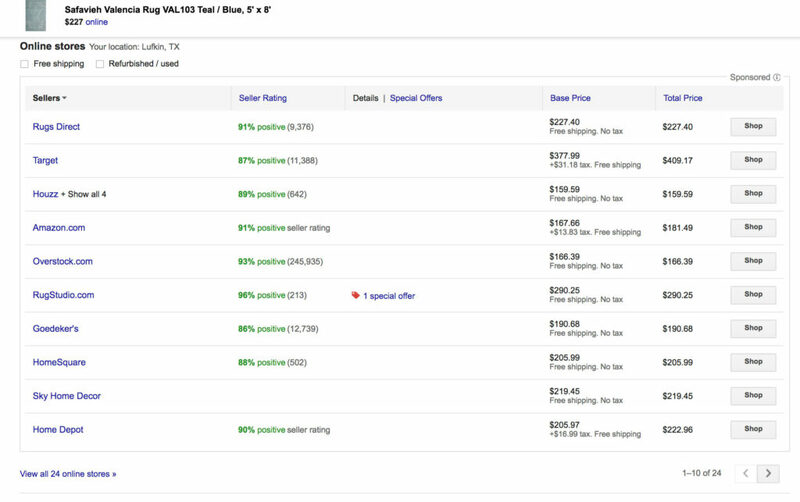 I did not know about searching for the best price using Google – thanks! For small entry coming out of the garage, what fiber rug would you recommend? Great info. Thanks for sharing. I learn so much from your posts. Thank you for this post. I see many items online that look good, your tips are always so very helpful and very practical. 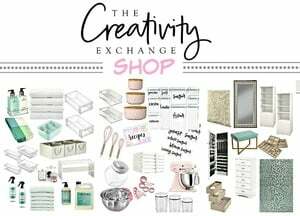 Many bloggers only offer high end shopping ideas and sources. You always offer practical and beautiful ideas and solutions.